Patrick and Courtney met me at Clinton Lake here in Lawrence, KS for their engagement photos. This area works really well for photos. We can wander into the trees, dance in the tall grass or check out the local snakes. haha. Nope, not kidding, we saw snakes. Totally harmless but I’m not a fan of snakes. (That’s my squirrel moment for ya). Back to the engagement shoot and away from thinking about snakes. 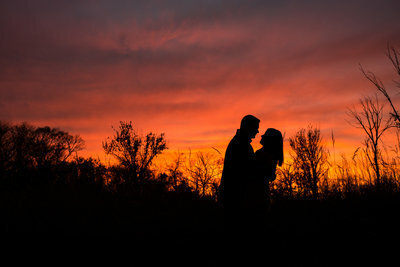 Patrick and Courtney decided to do a park feel for the engagement session as their wedding will have a more city feel. Two different looks for two big events. I like their style 🙂 Gives them more variety too with their photos. Win win all around. Have a look at their park engagement session photos. That’s the… “that was a big spider look”… or she heard the snake. haha. We did see a few snakes that day though. All harmless but none the less not my favorite thing to see. If you want to have two different looks for your wedding and engagement session send me a message here and let’s brain storm some ideas.